Most weights bench sets are simply not strong enough for proper strength training. The likes of Argos etc. will stock ‘Everlast’ or similar which have small maximum capacities of around 150kg. While this may sound like a lot, remember it includes your weight! That means if you weigh 85kg (13stone) the maximum you would be able to safely bench press with a basic one would be 65kg. That’s not a great deal to someone of that weight and through proper workout programs as a beginner you would expect to be doing high weight, low rep sets of up to your bodyweight (and beyond as your strength improves). From hours of research, it ended up with two very highly recommended options – the BodyCraft F320 and the Ironmaster. Both of which are considered excellent by their users. This fantastic bit of kit has an intriguing unique feature – when adjusting it the seat pad moves backwards meaning your head stays right at the back of the unit at all incline/flat angles. This probably sounds rubbish, but it means when doing incline movements inside a power rack you can get yourself into position to rack/unrack the bar without the bench legs hitting your power rack legs. No others can do this! 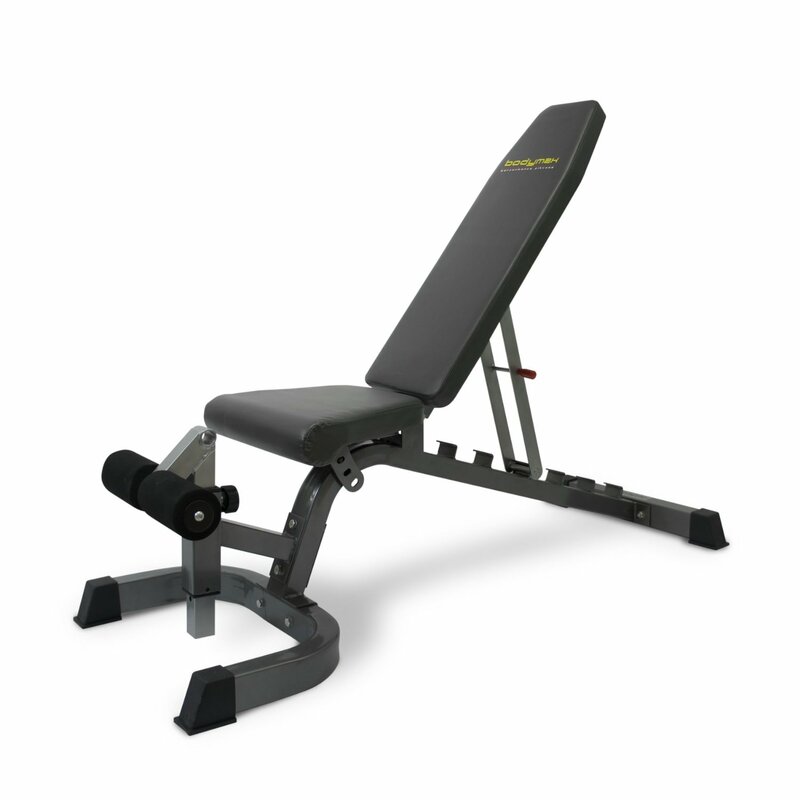 As part of the sliding mechanism the seat goes goes down very low which is useful for doing dumbbell exercises as you can easily pick up/drop the weights without straining your arms or shoulders. It ends up about 9″ off the ground which feels great. When flat, the bench is one of the lowest adjustable benches on the market with a height of c.18″ making it ideal for shorter people as you can still get leg drive when on your back. In terms of adjustability it goes from decline up to near vertical. One draw back is it does not quite go into a 90 degree vertical position. Construction is very robust, the BodyCraft F320 is for home or light commercial use, so is ideal for most applications in your home gym. It is made from 12 gauge steel which is fantastic quality and will withstand 800lbs on it which is over 360kg, this should be plenty for most users. Highly recommended weights tool, and the one I bought due to its height advantage over the Ironmaster below. This weights FID has a much sturdier construction than most others, capable of taking 1000lbs (over 450kg). It’s made with a mix of 11 and 12 gauge steel. At c.21″ the Ironmaster is quite high when flat. Shorter users (like me) need to use a platform to get into a flat foot position in the horizontal setting. Very fast system to change incline/decline – using a foot pedal you can quickly change the incline setting of the bench in seconds. Very, very useful! There are a massive amount of accessories available to add on. Your home gym could be based around a Ironmaster with the likes of hyperextension, dipping, leg curl, preacher, lat pulldown and pull up attachments all available. Ultimately this is one of the best options around.